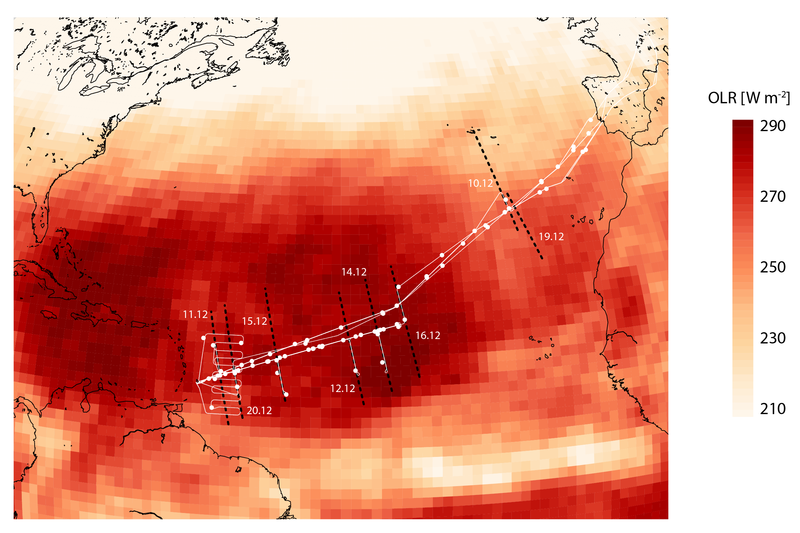 EUREC4A’s core measurements are designed to test hypotheses related to the interplay between clouds, convection and circulation and their role in climate change. 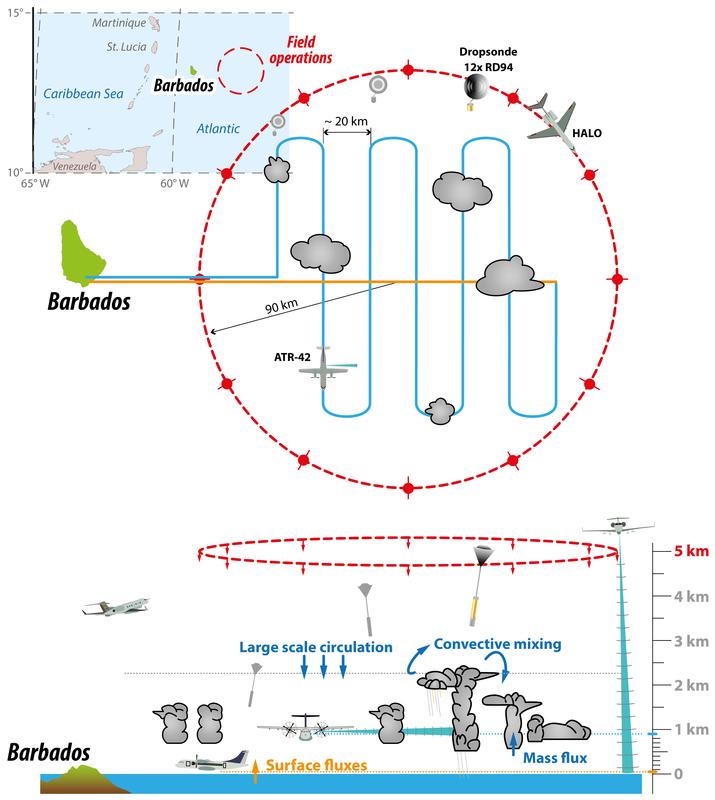 To do so EUREC4A will build on a decade of measurements in the tropical Atlantic; measurements initiated with the establishment of the Barbados Cloud Observatory in 2010, and continued with two aircraft campaigns, NARVAL in December 2013, and NARVAL2, in August 2016, with the German High Altitude Long Range research Aircraft HALO. More information about these experiments is provided on the NARVAL pages here. The core, and presently supported, measurements will focus on quantifying how cloud amount in shallow cumulus layers responds to changes in the large-scale environment, how shallow clouds contribute to convective aggregation, and test retrievals of cloud and atmospheric properties. Through international cooperation complementary objectives could be explored. These range from tests of ocean mixing processes, to processes influencing convective organization, to the much broader question of the dynamics of the Atlantic Tropical Convergence Zone. The animation shows convection resolving ICON simulations over the tropical Atlantic accompanying the NARVAL campaigns (by Daniel Klocke, DWD and Matthias Brueck, MPI-M). Emergent phenomena are featured in unprecedented detail, ranging from cold-pools of small cumuli, interacting squall lines of deep convection to hurricanes evolving from breaking easterly waves. Over 40 days are already simulated within the period of NARVAL-I (Dec 2013) and NARVAL-II (Aug 2016). The model resolution is 2.5 km with a nested domain of 1.2 km over the western part of the domain. These results are further used as input to large-eddy simulations with ICON within the HD(CP)2 project. The nucleus for the Field Study involves the deployment of two research aircrafts, an array of research vessels, advanced ground based remote sensing, a new generation of sophisticated satellite remote sensing and state-of-the-art turbulence-resolving modelling (100 m, over thousands of km). 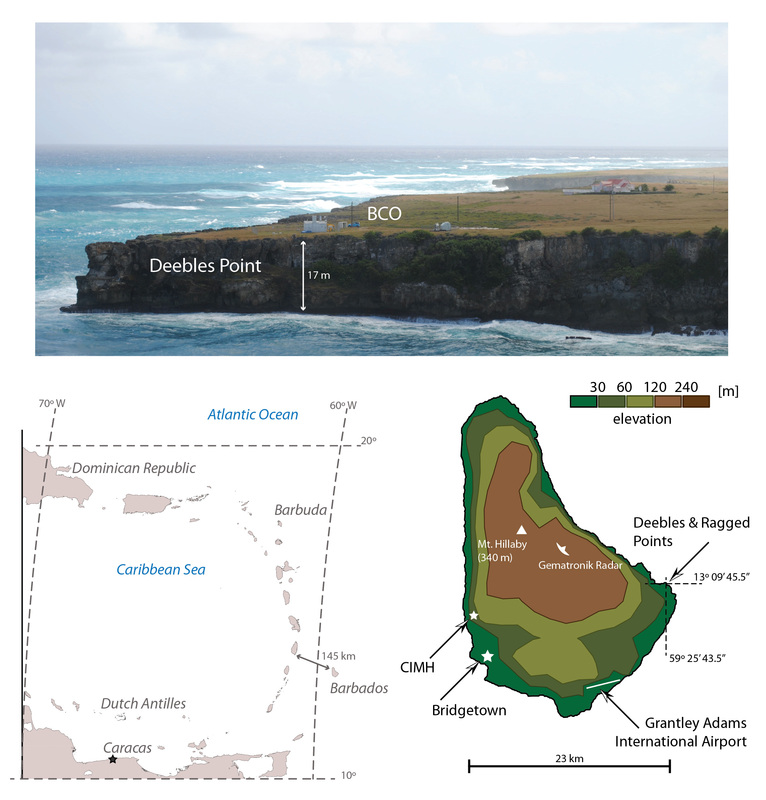 Operations will focus on an area over the shelf oceans east of Barbados (57 W 13 N) for a six week period between 12 January and and 23 February 2020, with aircraft operations between 20 January and 20 February. This period will overlap with ADM-Aeolus and EarthCARE, two flagship satellite platforms of the European Space Agencies Living Planet Programme. NARVAL2 and EUREC4A are funded with support of the the Max Planck Society, the German Research Foundation, the European Research Council through an Advanced Grant, the German Meteorological Service (DWD) and the German Aerospace Center (DLR).